By this point in their career, anybody with half an ear to the ground will know of Whitechapel. Beginning as just another deathcore band, they’ve branched out just enough to make themselves rise above the racket. 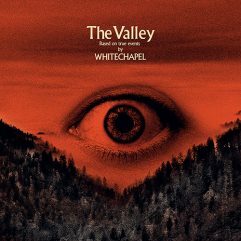 Since the announcement of this album’s release last year Whitechapel have been warning that things would be different, and they waste no time showing off their latest evolution. ‘When a Demon Defiles a Witch’ opens with the sort of deathcore stomp that is their stock in trade , before switching to clean vocals in the middle section and changing the sonic landscape around it to suit with a more current metal soundtrack. The experimentation takes a rest through the brutality of rather straight up tracks ‘Forgiveness is Weakness’ and ‘Brimstone’, setting early high water marks until the band unleash ‘Hickory Creek’ upon your senses. While it’s understandable that Whitechapel want to continue to pursue other musical avenues, this comes off as a slightly heavier Five Finger Death Punch track. Phil Bozeman’s vocals even carrying a similar baritone inflection that is hauntingly close to Ivan Moody and Corey Taylor in full Stone Sour ballad mode. From this awkward, but impressive low (I am sure it will win fans after many a listen) The Valley begins its crushing walk towards redemption with the bulk of overt experimentation out of the way. From here on the band experiment more with tempo, adding more weight to their already dense sound on a track such as ‘Third Depth’ which opens with a wispy sense of Tool before they up the intensity as only Whitechapel seem to be currently capable, or the almost thrash pace on ‘We Are One’ that also has one of their better guitar breakdowns. ‘Doom Woods’ finishes the album on a high note, summing up everything that went before it. Whitechapel have continued to push the boundaries of the genre they were such a large part of early in their career. With this album they are bound to lose some early fans, but the move into a more modern all encompassing metal sound will far outweigh those who chose to walk away when things really start getting interesting.